Considering what a constant role model you are for your kiddos, it’s important to think of ways that you can show them what good mental health looks like. After all, you want your children to be happy and healthy and take good care of themselves, so leading by example is a great way to do just that. You are probably so busy taking care of everyone else that you rarely have time to take care of yourself. While this is a common scenario for most moms, it can lead to issues like burnout, raise your stress levels and cause you to get sick. Starting today, carve out some time to take care of yourself. With the help of an app such as Headspace, even just 10 minutes a day can lead to a healthier, happier life. If you have a few more minutes, consider a relaxing bubble bath, take a brisk walk around the neighborhood or watch a show you enjoy while your kids are still awake. Doing so will show your kids that you are important and deserve self-care, which will encourage them to respect you and do the same for themselves as they get older. Additionally, mind what you eat. Set an example by eating all of your fruits and vegetables, taking important vitamins and supplements. 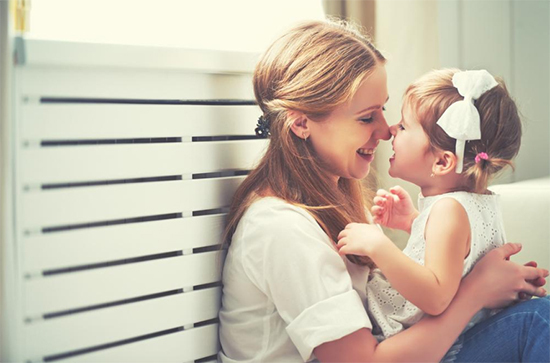 Amway is a reputable source of nutritious products and offers other health and beauty products that you can use to pamper yourself and show your kids the importance of taking care of mom. Yes, being stuck in traffic stinks. So does having a computer that suddenly freezes up, a fridge that stops working and a to-do list that is a mile long. While you are tempted to complain about these issues, try focusing more on the good things in life. When you are sitting in traffic, instead of swearing up a storm about being late, try to remain calm and mention that sometimes there are things in life that we cannot control, including heavy traffic—then use that time to catch up with your kids about what’s going on with them at school. When things break, rather than saying how stressed you are, try to fix the problem yourself or call in a repair person. Your kids will observe your reactions to the common stresses of life and will learn how to cope in a healthy and positive way to these problems. Another great way to model good mental health is by keeping everything in perspective. During those weeks when you can’t seem to get to the grocery store and you have fed your kiddos Burger King for the third day in a row or you let them stay up too late watching TV and now they are cranky, remember that this too shall pass. Instead of beating yourself up with comments like “Your lame mom hasn’t made it to the store so we’re eating fast food again for dinner,” say something like “Hey, it’s been an extra busy week so I’m going to get takeout for dinner—would you rather have pizza or burgers?” If you are not down on yourself on the days when real life gets in the way of ideal parenting, your kids will also learn to keep a healthy perspective. While it can be jarring to realize how much our kids are paying attention to everything we do, it’s also a good reminder to take better care of ourselves. We want our children to grow up to be well functioning and capable adults with good mental health. Fortunately, by practicing self-love, reacting calmly to life’s stresses and keeping everything in perspective, we can rest assured we are being the good role models our kids need.